I’ve decided to hold a small sale of upcycle projects, books, vintage dishes, and odds and ends Feb 3 and 4. You should come! I’ve set up an Eventbrite event for the sale. I’ve added an event to the Facebook Upcycle page. There is no reason you can’t plan to stop in! I plan to add more photos of things for sale to the Facebook page so go there, like it, and watch. 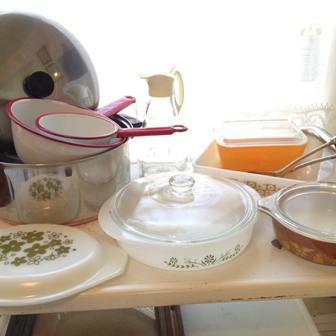 Vintage cooking and serving dishes.